If you would like to link to EuroSec 2012 from your website feel free to use the banners provided below. Just paste the html snippet next to the banner of your choice in a web page. If you prefere, there is also a printable poster available. 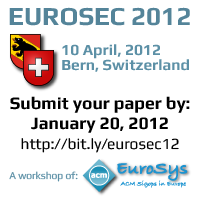 Click the thumbnail to download the EuroSec 2012 poster.